You’ve seen them at anti-Trump rallies, the old Occupy Wall Street protests, and various riots from Baltimore, to Ferguson, to President Trump’s inauguration ceremony – Left-wing protesters that hide their faces behind masks. Admit it, you’ve often wondered why they go through the trouble of hiding their faces if they’re so upset about the cause célèbre of the day. If I were that upset about something, I’d surely want my presence known. Are they trying to prevent being identified by law enforcement during their protests? Are they hiding because they’re not ultimately proud of their actions? No. None of these are true. Boom! You heard it here first. Now, obviously this is a joke. But the best jokes have an element of truth to them, and is it so preposterous to believe that a majority of protesters hiding their faces live at home with their parents? Of course not … And there’s actual evidence that supports such a notion! A recent study out of Germany analyzed nearly 900 left-wing political activists and concluded that 92% of them – 92%! – still live at home with their parents. Most of our readers probably assumed this was a possibility, but now we have scientific evidence that liberal activists and/or violent leftist protesters do indeed live in their mom’s basement. 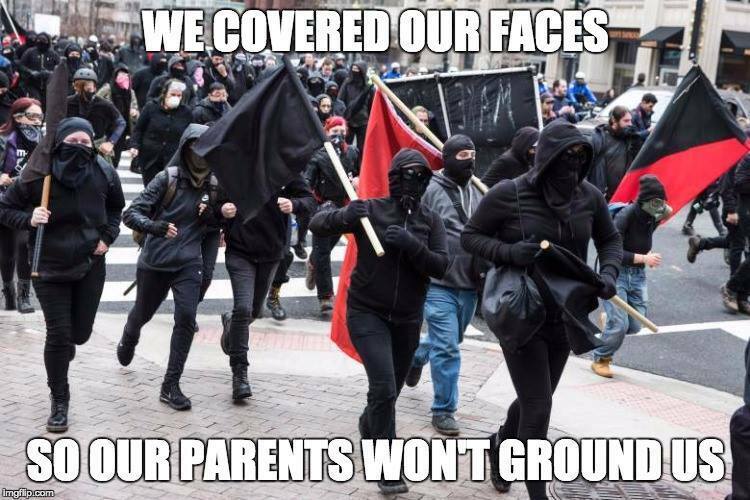 In that case, it’s probably best they cover their faces before they get home and their parents teach them a lesson. Do you agree with this joke? Like and share with your friends!